WASHINGTON — The growth of national health spending, which surged as millions of Americans gained coverage under the Affordable Care Act, slowed last year, the Trump administration said on Thursday. Health spending in the United States totaled $3.5 trillion last year, up 3.9 percent from 2016, or about $10,740 a person. It accounted for 17.9 percent of the economy, officials said. But the rate of increase for the major categories — drugs, doctors and hospitals — was more modest than in recent years. For the first time in several years, health spending grew at about the same rate as the economy as a whole in 2017. So the share of the economy devoted to health care stabilized. By contrast, over the past few decades, health spending has generally grown faster than the economy. The 3.9 percent increase last year — down from 4.8 percent in 2016 — was the lowest since 2013. “The relatively low rate of health spending growth in 2017 was similar to the average annual growth during 2008-13, which predated the major coverage expansions,” said Anne B. Martin, an economist in the office of the actuary at the Department of Health and Human Services. One factor that may have contributed to the slower growth in health spending is that the share of the population with health insurance fell slightly last year, Ms. Martin and her colleagues wrote in the journal Health Affairs. They did not explain the decline, although government surveys suggest a small reduction in the proportion of people who had public insurance coverage or private plans obtained through the insurance marketplace. In addition, more people with insurance have high-deductible health plans, which tend to make them cost-conscious because they are personally responsible for a larger share of their medical costs. Health spending grew rapidly in 2014 and 2015 because of the expansion of Medicaid and private insurance coverage under the Affordable Care Act, as well as the use of expensive but highly effective new drugs to treat hepatitis C.
The Affordable Care Act was signed by President Barack Obama in 2010, and the main provisions expanding coverage took effect in 2014. Federal spending on health care shot up nearly 11 percent in 2014, mainly because of the expansion of Medicaid, but the growth has slowed every year since then, the report said. Federal spending on health care totaled nearly $1 trillion last year, and that does not count the huge tax subsidies for health care and coverage. Spending on Medicaid, which now covers more than 70 million low-income people and is financed jointly by the federal government and the states, continued to grow in 2017, reaching a total of $582 billion, the report said. But the rate of growth slowed for the third straight year. Medicaid spending — the total of federal, state and local funds combined — increased last year by 2.9 percent, following growth of 11.8 percent in 2014, then 9 percent in 2015 and 4.2 percent in 2016, the administration reported. President Trump and Republicans in Congress tried last year to roll back the expansion of Medicaid, but ultimately failed. Federal Medicaid payments increased less than 1 percent last year, following growth of 4.6 percent in 2016 and double-digit growth in 2014 and 2015. 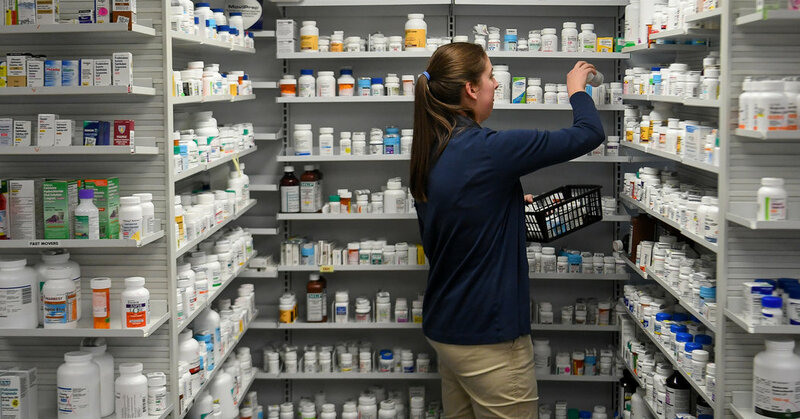 Despite alarm over high drug prices, the administration reported that spending on prescription drugs at pharmacies, grocery stores and other retail outlets increased last year by just four-tenths of 1 percent, to $333 billion. That was the slowest growth since 2012, when many blockbuster drugs lost patent protection, driving down prices and total spending. Those figures do not include spending on drugs in hospitals, where patients receive some of the most expensive drugs. Declines in generic drug prices, lower price increases for existing brand-name drugs and a reduction in the number of prescriptions for pain medications contributed to the slower growth in drug spending last year, the administration said. The growth of Medicare spending for hospital care also slowed last year, and federal officials said one reason was increased enrollment in private Medicare plans. Older Americans in these private Medicare Advantage plans “tend to use more physician and less hospital services,” compared with people in the original government-run Medicare program, the study in Health Affairs said. More than one-third of the 60 million Medicare beneficiaries are in private plans, offered by companies like Humana and UnitedHealth. Although the United States spends more on health care per person than any other country, the growth of spending here has slowed in the last decade. “Health care spending growth averaged 4.3 percent per year during 2008-17, compared to an average annual rate of 7.3 percent over the 1998-2007 period,” the report said. Household spending on health care also slowed last year, increasing 3.8 percent after growth of 4.8 percent in 2016. The main reason, officials said, was slower growth in consumers’ out-of-pocket spending, which includes co-payments, deductibles and payments for services not covered by insurance. Out-of-pocket spending grew 2.6 percent last year, to $365.5 billion, which was slower than the 4.4 percent growth in 2016. January 11, 2019 Comments Off on Mary Poppins Returns: Can tuppence really save the day?